One of the guiding principles of my trip is to attempt to enjoy regional cuisine along with the regional wines as often as possible. 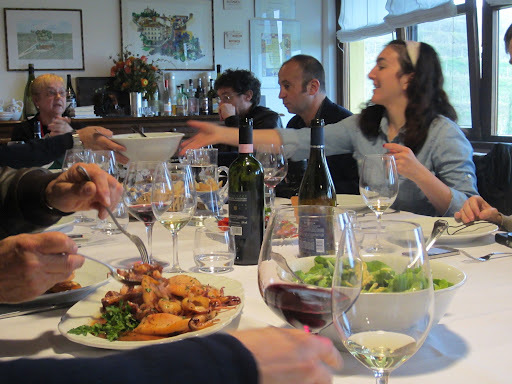 My theory is that the cuisine of the region organically developed to match with the wines of the region (up until about 40 years ago), and if I can understand the food of the region I may better understand the wines, and the experience will strengthen the memory. The major difficulty I have with this principle is the restrictions of my budget, which is important I adhere to if I want to travel for as long as I intend. This isn’t much of a problem, except that the food I can afford is not always the best. For this reason I always relish any invitation I have for lunch or dinner with one of my winery hosts, not only because it is a free meal. The occasion has increased since arriving to Europe, particularly Italy where I have enjoyed lunch and dinner on numerous occasions. 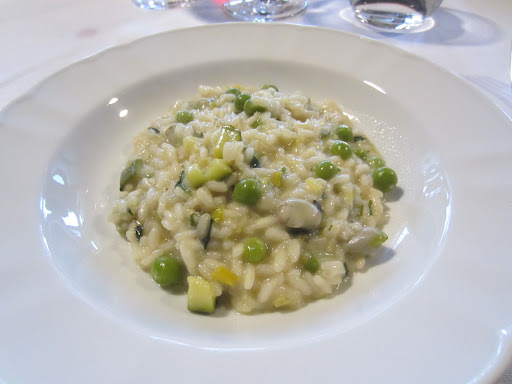 The food experience I had on my second day in Friuli however, was one of the most surreal and amazing, and will stay with me forever, as you will read below. The first appointment for the day was at Bortoluzzi, who I had arranged an appointment with during Vinitaly. The winery this year celebrates its 20th birthday, established by experienced and qualified wine expert, Giovanni Bortoluzzi. The winery produces a range of varietal wines focusing mostly on white wines, and are very well-known for their sauvignon blanc. 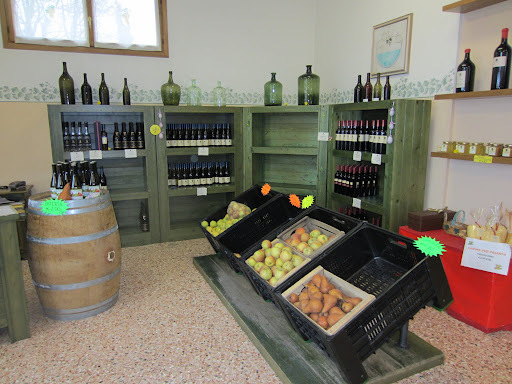 In their vinoteca they not only sell their wines in 750 ml bottles, but also in the traditional jugs and bag-in-box, as well as fresh pears and apples when they are in season. I knew beforehand that they would be bottling all day, and would therefore be quite busy. Unfortunately my host Angela Bortoluzzi was taken ill and holed up in bed with a fever, which made things difficult for her brother Alberto, who was well and truly focused on the bottling, and also didn’t have my number to call and reschedule/cancel. He was very nice to quickly show me around the winery and taste a few of the wines they would be bottling, and in apology gave me a few bottles to take with me (which I felt a bit guilty about). Click here to read my tasting notes. The Bastianich name is almost totally unknown in Australia. In fact it’s almost totally unknown outside of the United States. In the United States however, it is practically a household name thanks to Lidia Bastianich, who is the American equivalent of Stefano DiPieri. Originally born in the now Croatian town of Pula, she and her family relocated to New York in 1958 as refugees. In 1971 she and husband Felix opened their first restaurant in Queens, beginning one of the most important food empires in the United States. Lidia spent the following ten years training as a chef, and has since become the most influential Italian chef in the country, revolutionising the way people thought of regional Italian food. Lidia has appeared on numerous television shows, published many books and her family have also become important figures, such as her son Joe who was a judge on the American and Italian versions of Masterchef. As part of the Empire Joe has also established wineries in Friuli (historically part of the same region as Istria where Lidia and Felix are from), Tuscany, Piedmont and Mendoza. During Vinitaly I was introduced by Trembath & Taylor to Wayne Young, a relocated American, who is the factotum/jack-of-all at Bastianich, but mostly handles the marketing & communications. When I told him I’d be in Friuli the following week he mentioned that a group of bloggers from the USA (and one from the UK) would be there all week and Lidia was cooking for them on the Tuesday, he very generously invited me to join them as a fellow (amateur) blogger. As mentioned before, Lidia Bastianich is not a well-known name way down in Australia, so the significance of this didn’t hit me until the day before. Over a sumptuous four course lunch prepared with fresh seasonal ingredients (best risotto ever), Wayne introduced the Bastianich wine story, and some of the wines as well. We were also joined by an Italian Chef/TV personality, who was filming proceedings. 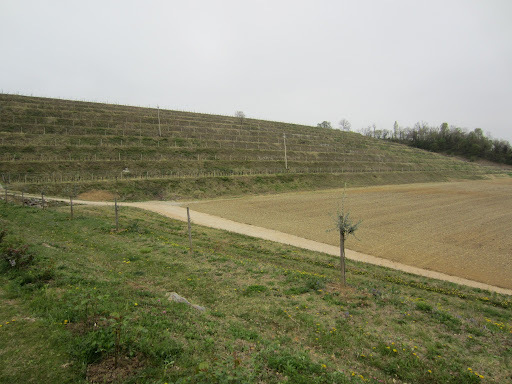 In Friuli the winery (which has been around since 1997), sources fruit from 28 hectares of vineyards in two parts of Friuli – Buttrio and Cividale – which are similar in terms of soil but quite different in terms of microclimate. Thus varieties and wine styles differ depending on the site. Click here to read my notes from the tasting over lunch. Way back in 1896 Eugenio Collavini supplied wines to the Udine nobility when he began his winery, but he may not have known how important his name would become in the Friuli region. His son Giovanni took the winery through two world wars, and his grandson Manlio would take the winery into the new era through innovations both in the region and in the markets. The winery holds a very important place in Italian wines, as it was a pioneer in premium pinot grigio wines, as well as unique sparkling wines made from Italian varieties such as pinot grigio and the native ribolla gialla grape. Manlio is now assisted by his sons Giovanni, Eugenio and Luigi, the latter of which was kind enough to not only host me through a tour and tasting, but also put me up in one of the best local hotels/restaurants. 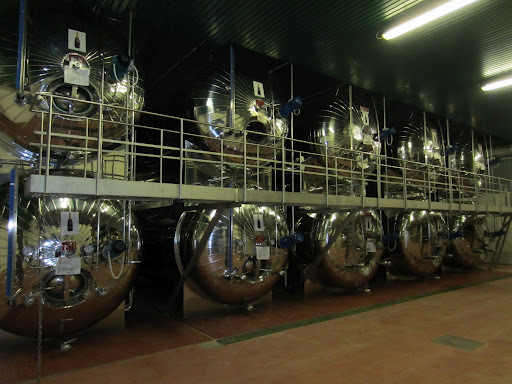 The aforementioned Ribolla Gialla Spumante is one of the most iconic in the category, as it not only uses a unique variety, but is also made in the charmat method, sitting on lees in pressurized tanks for several years before bottling. The tasting revealed the entry-level wines are all very sound but safe wines, whereas the more premium wines are fantastic. Click here to read my notes from the tasting. Click here to see more photos from Day Two in Friuli, Italy.